I love British advertising. The Famous Grouse (TFG) commercials are by far some of the most charming and sophisticated adverts around. And the Scotch ain't so bad either. I once spent about four hours with a Scottish risk manager in a pub in Bath and I couldn't understand a word he said...and he was speaking English. I was able to pick up key points. He wanted a program with one large deductible for all lines of commercial insurance via a captive in Bermuda. That's not probably what you would have picked up on but he also drank The Grouse and like most Scots preferred it over Single Malts because, "...hew ken affooord Talisker. New one where em froom, mate." TFG has always been the Scotch of choice in the U.K. and after trying it nine years ago I left the fold of Johnnie Walker Red and Black. It's nice in the Winter with a little water or soda and a twist of a lemon peel rubbed on the rim of the glass. If you're a Walker fan give it a try. If you're a Ushers fan get another job. TFG is worth it. This quail belt was brought to my attention by Stewart from the blog, A La Brouche. Amazing recipes, amazing writing and a unique voice all his own. I gotta try his Terrine de Porc. Stew wasn't the first to turn me on to Stafford's but I owe him for reminding me. This outfit flies below most folks radar and so it's not well known. But if you're from GA and you hunt quail...you know it. I'm not much of a hunter. The last time I went hunting (on a full stomach) was for pheasant on the Illinois - Wisconsin border in early December. For once there was no wind and a soft snow came straight down instead of the 45 degree angle I had grown accustomed to in Chicago. Three of us warmed up with some clays and I did pretty well with a borrowed Italian automatic 12 gauge. But I couldn't hit anything with real wings. And to be honest - my heart wasn't in it. That is, not until we broke for lunch and I had smoked pheasant for the first time. Then I knew...in my heart...I wanted to kill and eat every pheasant I could find. God, they're good. 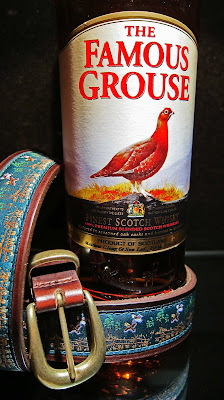 I'd like to find a pheasant belt like this quail number from Staffords just to remind me of that eye opening moment. Find a good butcher and order a brace. They're perfect for this time of year and have a pre-dinner Grouse on the rocks. I can just see you sitting by the fire place in Duck Head khakis, a pair of Gokey chukkas and this Orvis flannel shirt as you stir your drink with your pinkie while Winter rages on the other side of your front door. Great post. I've been a TFG drinker since the 80's. You couldn't buy it around here so my sister-in-law brought a couple of bottles from Long Island whenever she came. Now its here and still my drink of choice. Fight on mark about the smoked pheasant as well! Great belt. Stafford's is GREAT. I've tried to shake it, but I'm a Johnnie Red man. Pinch, too. (What a goddamned bottle, huh?) Laphroaig and Glenmorangie when I'm not buying. Thanks for slicing my bologna, kiddo. Got to love Staffords and TFG. Great post. The problem is that now I am really wanting quail and it is only 9am! Grouse is the biz. my sister just brought over some Bailie Nicole Jarvie (http://www.bbr.com/producer-1228-bailie-nicol-jarvie-blended-scotch) which is a similar idea (good blend) but it was a touch sweet for me, though pricewise insane (ie cheap). Def' prefer FG though. Damn, I was planning on writing about the Grouse tonight. I made myself like scotch on the Grouse because I knew I was going to drink a better drink in the corporate world. I gotta echo Mr. Lane, but at least it's high noon now. I'm not waiting. Time to saunter over to the bar at the thai place downstairs. I went to a Christmas party last year that didn't have scotch so I went and bought my own bottle. I wanted something different for cheap so I got TFG for the first time. I took the bottle home and drank the rest of it in two days. Definitely better than JWB, and that's sayiing a lot since I prefer JWB over several high priced single malts. You can't argue with the taste for the price. It's one of the bottles I drink when I don't have enough ends to justify a Laphroig or Talisker (which is often these days). Dear me, I usually agree with what is written on this blog, of which I am such a huge admirer. I am shocked you would advocate drinking blended scotch. I will not run you down too much for it I will simply say that when you are next in the UK I will offer you an education in single malts. Me too. It's a sleeper Scotch that flies under most folks radar. And for the dough it ain't half bad. Amazing so many Scots (if ever there were a budget conscious people) are loyal to THG brand. JRS- Stafford's is a treasure. Places like it are disappearing. Stew- Anytime. And thank you. 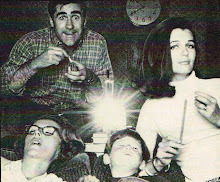 M Lane- Saw Cathy yesterday. Were on for three at eight. No magnums though. James- It looks interesting. I'll try and find it. Duck- Hey, you've beat me to a couple of things. Kat- Peaty rules the day. I also like Black Bottle. A blend of Islay single malts. Ben- A shame you're a few hours behind but you seem to be adjusting well. David- That's the problem with single malts and the Scot adversion to them - - they're damned expensive. I like adding a little Laphroaig to Black Bottle. A great way to stretch the $ when it comes to the single malt. You can't be expected to go through this blog and see the single malt I'm a fan of. So, click on the links above. I remember Johnnie Walker doing a series of single malt tastings in 1992(were you 6 years old then?). Talisker was my fave then and I've even been lucky enough to score some Talisker limited releases back in 1990 (I think you were 4 years old). Rare, expensive and so very memorable. But Laphroaig has stolen my soul. There's a couple more single malts coming up on the Friday Belt so stay tuned. Such a great post. I quite enjoyed it. I hope you are enjoying the weekend. Cheers! I am pleased to see your reply. The only thing I drink TFG with is a 34% to 66% mix with Stones Ginger Wine on cold shoot mornings. The offer stands even if you require no education. tomtom- If you're buying...I'm learning. If you love to eat pheasant but can't or won't hunt them, then you can always order some from MacFarland in Wisconsin. That's where the White House gets theirs, or so they say. Staffords, by the way, is in the heart of SE quail hunting territory. Worth a visit. Have you joined the friends of Laphroig? I hear you get the opportunity to own a bit of land at the distillery. I'm late to the party, as it were, but if you want a truly budget friendly blend, try Duggan's Dew if you can find it. ZZ- Thanks for the rec. They're fairly easy to get in NYC. David- Had I filled in all those cards over the years I'd probably be a laird. Anon- I like a good hunt. I live in Bath, so I'd be interested to know which pub you went in. Surely The Star? Maybe the Old Green Tree or the Coer de Lion? If you're over again, I'd be happy to take you for an ale. Raymond- Thank you for the invitation. It pains me to admit that I've kept my old diaries going back to this lunch that was in 1991. But they're in a storage facility in FL. I do remember it was close to the shopping area of downtown and that the risk manager was a regular. There were 5 or 6 of us and when closing time came we were allowed to stay. Scottish people are usually amused by how much American visitors spend on single malts. When it comes to whisky, most of them go for something like TFG - especially if Tesco has it on the sale shelf or something.